Loc: 1311 AN3. Don't miss your opportunity on this item; if you decide to buy later it might be gone! Style: 2Pcs Long Sleeve Tee Red Pant Set. Top: Mickey Mouse Graphic In Front. Pant: 2Pockets In Front, 2 Pockets On Cack. 100%Cotton. It is a Size 24 Months. Fits height 32-33.5" and weight 26.5-30 lbs. Shirt features Mickey Mouse playing football on the front. Very cute Disney Outfit. Disney Mickey Mouse. 2 Piece Outfit. I have several baby clothes listed! LIGHTNING MCQUEEN. Cars "I Am Speed" graphic hoodie and pants set. Zip front hoodie. Rib-knit cuffs and hem. SIZES IS BABY SIZES 12 MONTHS TO 24 MONTHS. 100% COTTON. TANK TOP WITH SHORTS. STYLE: 305P. Ribbed collar with faux fur (looks like a white beard). Mickey is all set to get your jolly little one ready for the season. Set includes top, pants and coordinating Santa hat with embroidered details. Includes Red T-Shirt, Pants, and Shorts. I will try to get back to you as soon as I can. 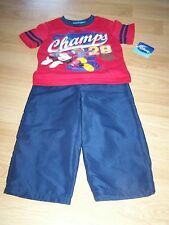 18 Months Disney Pixar Cars 2 Pc Set, Short & Tank Top Outfit, NEW WITH TAGS!! THERE ARE WHITE VERTICAL LINES GOING THRU THE RED. PANTS ARE ELASTIC WAIST W/EMBROIDERED PATCH ON THE LEFT LEG. GREY PIN STRIPES DOWN EITHER SIDE. RED HOOD AROUND THE ARMS AND RED STITCHING ACROSS THE BOTTOM. 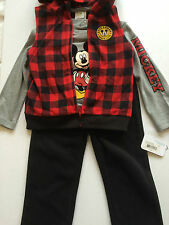 Disney Mickey Mouse Toddler Boy's Shirt & Shorts Outfit Set New NWT. Mickey Mouse Toddler Boy Graphic Tee and Shorts Outfit Set Front graphics of Mickey Mouse and phrase "Mickey Team MVP" Ribbed crew neckline Short sleeves Straight hem Pull-over style Shorts. BOY'S TODDLER DISNEY CARS LIGHTNING MCQUEEN HOODIE TRACK SUIT SIZE 24MO NWT! This outfit is a red shirt that is a short sleeve pull over with pull on blue red plaid shorts. I describe every thing the best that I can. 3 PC SET, THE TOP IS AN RED/WHITE TIE DYE. THE FRONT HAS A PARK PICTURE W/AN EMROIDERED DALMATION PLAYING. ON TOP IT SAYS PLAYING IN THE SUN. SHORTS HAVE AN ELASTIC WAIST W/DARK BLUE STITCHING TOP, SIDES AND BOTTOM. MICKEY MOUSE. shorts with Button & elastic waistband. machine wash. 2-piece set includes. YOU ARE BUYING THE T SHIRT OF BUZZ FROM TOY STORY. THIS T SHIRT IS SHORT SLEEVE, THE T SHIRT IS MAROON, THE FRONT OF T SHIRT HAS BUZZ CHARACTER . 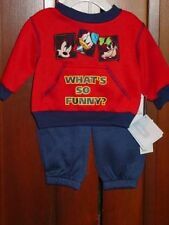 You are buying a Disney Cars little boys outfit set. Both red, zip up jacket and pants. If you have any ?. s, feel free to ask. I will not accept SASE. Both a sleeveless top and a matching pair of shorts are included in the set for great value and easy outfitting. The cotton-blend tank has a sparkly Mickey Mouse graphic on the front, while the 100% cotton shorts have a hassle-free pull-on style and a classic plaid pattern printed all over.